Hey. I know where you can get some music online. Shhh! Why am I whispering? It’s all legal. You get to listen to streaming audio online for free. If you hear something you like (or love), you can shell out to download high quality tracks, or even have a CD printed and shipped to you. It’s the radio advertising model taken online. Magnatune is a netlabel: one of a new generation of music labels that distribute their music online. John Buckman created the site after his wife had a disastrous experience with a traditional record label. Now he hosts DRM-free music under an Open Music license, lets people choose how much to pay, shares 50% of the revenue with his artists, and encourages people to give away three copies of the music that they buy, and much-much-more. This guy isn’t a flower smelling infohippy. He’s just someone that listened to the plight of the artists, and actually did something about it. Now, I demand that you immediately go check out (and buy) Shiva in Exile! Why? Because it’s scrumptious. This was written by Gustav Bertram. Posted on Friday, May 23, 2008, at 14:08. Filed under Entertainment, Free Culture, Music, Open Music. Bookmark the permalink. Follow comments here with the RSS feed. Post a comment or leave a trackback. Gustav Bertram is a computer scientist wannabe. He theorizes about autodidacticism, free culture, information economics, intelligence amplification, computer science and technology. Constant Flux is his future hacking blog. 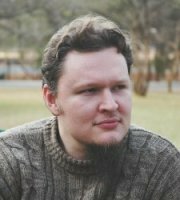 He lives in Randburg, Gauteng, South Africa, and is currently employed as a software developer. For more information, see his Homepage. This blog by Gustav Bertram is licensed under a Creative Commons Attribution-Share Alike 2.5 South Africa License.